In December 2014 (six weeks ago) I had ordered four coffee mugs from Society6. They were running the usual Christmas promotions and I could get four mugs for the price of three. Still pretty expensive for photo mugs that you could also get in offline shops around every corner or online in a gazillion other cheaper shops but hey – I admit that I only wanted them so that I could brag “Hey, this is my photo on this mug!” and recommend Society6 to my friends and family. Ok, so it took them six weeks from USA to Germany, of which one week is courtesy to German customs since there was no invoice on the outside. I had to send them infos about the order and about the payment (print from Paypal) and I am really lucky that I did not have to pay taxes! I didn’t know that I had ordered a puzzle! At first glance the fourth mug looked ok but that’s not the case. It is full of scratches from the debris and the handle is loose. This one won’t survive the dishwasher. The reason for this chaos is the really poor packaging. Well, poor doesn’t even really cover it. Stupid would be more suitable. 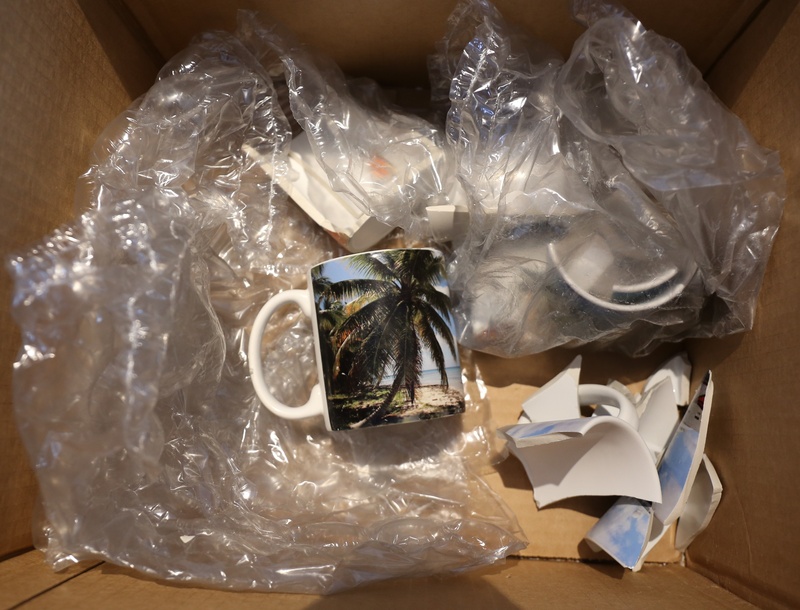 The only good thing is that they used one sheet of bubble wrap per mug. But the box is so huge (twice the size the mugs would have needed! ), the mugs bounced around and had a party. Great, really great. This disaster will definitely not convince me to order from Society6 again. I have filled out their form for such situations and asked them for a full refund. I could ask for a new delivery but I do not want to wait 6 more weeks for a second puzzle matching this one. No, thank you. What are your experiences with Society6 as a buyer? Free World Wide Shipping on Art Products for Next 8 Days!